I was worried that this penguin documentary would be cutesy and shallow and would try to entertain kids rather than teach them anything. The worst examples of this type of movie anthropomorphize their subjects, and overdo the emotion with cute, waddly, playful music. To a very small degree, my fears were justified. But on the whole, March of the Penguins is a better-than-average nature documentary. It is serious enough for adults, with enough wonderful footage to please kids of any age. Unlike Deep Blue, a recent documentary about life around and under the ocean, March of the Penguins has a story arc. This alone makes it a much better film. 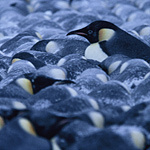 Director Luc Jacquet follows the emperor penguins from March through November. The penguins start in March — autumn in Antarctica — at the icy edge of the continent. They start walking inland “as much as” 70 miles (or to phrase it less dramatically, “no more than 70 miles” — but still impressive when your legs are 7 inches long). Once they’ve arrived at the breeding ground, the penguins pair up. After some penguin love, the female lays a single egg, which must be cradled between the tops of her feet and the insulating flap of her belly in order to withstand the freezing temperatures. Soon she passes the egg to the father (not a risk-free proposition), and then she walks back to the water to eat, having lost “up to a third of her body weight” (or, “no more than a third of her body weight” — but still...) producing the egg. The males huddle together for warmth, going for “as long as 120 days” (“no more than,” but still...) without food. The females return, bellies full, to feed their chicks. They time their return within a day or two of the chicks hatching. The fathers have been saving up one meal, just in case, in a special pocket in their throats, which is the only thing the chicks have to eat until their mothers return. Once the mother is back, now it’s the father’s turn to walk to the water, eat, and return with food. They take turns like this until November, when the 70-mile trek over ice has become a matter of a few hundred yards, thanks to the to melting of the intervening ice shelf. Morgan Freeman narrates from a script by Jacquet and Michel Fessler. Newsweek had singled out the narration as a point of disfavor. Forewarned, and with lowered expectations, I was pleasantly surprised at the relative substance of the narration. Of course, there are anthropomorphic comments and smug lead-ins to supposed-to-be funny footage. But by and large Freeman tells us just enough to help us understand what we’re seeing on screen. The story itself is amazing. I’m surprised at how much I learned. I had thought other documentaries and encyclopedia entries would have told me as much as there was to know about Emperor penguins, but March of the Penguins is rich in information. Although the photography is not as amazing as that in Winged Migration, it is competent, professional, and artful. More than that, the footage from photographers Laurent Chalet and Jérôme Maison helps tell the story, every step of the way. Original flute and piano music by Alex Wurman (a different composer is credited for the non-U.S. version) accompanies the film. It is generally “good,” by which I mean unobtrusive. Sometimes it tries too hard to set a mood of either peril or comedy. But compared to my worst fears, the score is pretty and thankfully neutral. The movie might be distressing for sensitive younger children. There are several dead and frozen chicks who don’t make it through the winter. A seal also nabs one of the females, and the narration reminds us that it actually killed two birds: the female and the chick who will starve without her. There is also a scene of penguin copulation (presented as an art-film love scene). But if your kids can handle the circle of life, they should love March of the Penguins. More importantly, adults can be moved, informed, and amazed without the cloying music or cutesy montages that ruin so many nature documentaries marketed only to children.